If you prefer another color combo other than blue and silver, please send us a message and let us know what you have in mind! We would be happy to work with you to create exactly what you are looking for! ♥ We use only 100% quality birch wood WOODEN dowel rods with our props which makes them uniform in color as well as sturdy. No broken, flimsy sticks here! ♥ We use boxes to ship our props, both USA and international bound orders to ensure they don't get bent or smashed. ♥ We have been featured in a variety of popular media outlets including US WEEKLY MAGAZINE, IN TOUCH MAGAZINE, PERFECT WEDDINGS MAGAZINE, and THE KNOT, as well as many blogs and websites including SWANKY CHIC FETE, BRIDEFINDS, and PRETTYLITTLEWEDDINGS.COM! We've even had celebrities including Jessica Simpson, and the Kardashian sisters use our props and we just recently made a large number of props for country star Toby Keith's record label - how cool is that?!? To see all the media outlets we've been featured in - visit our "about us" page! ♥ PLEASE, PLEASE, PLEASE include the date of your event in the "note to seller" section during checkout! If you don't include the date, we don't know when you need them by and can't guarantee they will arrive on time! International friends - please see our shop policies for shipping lead times before you purchase! 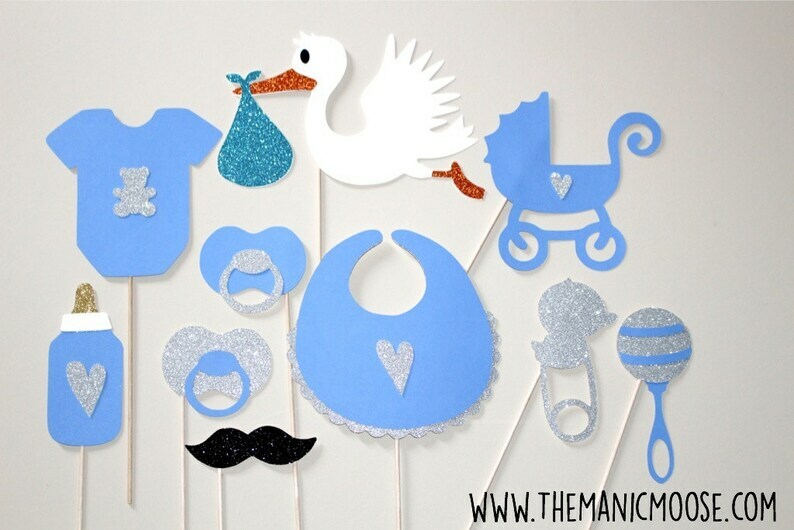 This listing is for a set of 10 ultra-cute baby props on a stick! Everything you need to make your next party a hit! Any kind of Special Occasion! Check them out by clicking the link below! Props are made of heavy duty card stock securely fastened to dowels. For complete shipping details and information, including information on International delivery, please see our shop polices prior to ordering. © All Designs featured in this listing are property of The Manic Moose and should not be copied or duplicated in any way. Items are okay. A bit different than what I thought. They will be fine for the event. Pricing a tad bit high. The props are okay, a bit different than expected. Will be fine for the event. We accept payment via Paypal and Direct Checkout (Credit Cards). If your payment is not received within 24 hours of purchase We will try to contact you. Your order may be canceled if payment is not received or special arrangements have not been made. Please remember that purchases paid to Paypal by check can take days to clear and your order will not be shipped until then. We lovingly create each and every item that leaves our shop and we take great pride and care in creating and shipping them. Please keep in mind that all items are handcrafted, so no two will be exactly alike which is part of the beauty of buying handmade. That being said, we want you to be happy with your purchase! Please note that monitor colors vary greatly- colors may appear different in person. If you have any questions or concerns convo us! If for any reason you are unhappy with your order, please contact us within 7 days of receipt of your items BEFORE leaving feedback and we will work with you to make things right. Once we ship the item we can not be responsible for lost or misdirected mail and are unable to provide refunds for such events. If you would like to insure your package please send me a message and I will add the additional cost to your order. All US bound orders are sent via USPS FIrst Class or Priority Mail depending on your package size. It is the buyer’s responsibility to make sure your current address is on file. All orders will ship to this address. If you would like your purchase to go to a different address please specify the third party address in the “message to seller” box when ordering. The Manic Moose can not be held responsible for mail delays or orders "lost in the mail" due to undeliverable addresses. Items Lost or Damaged in Transit: Once I place the item in the mail it becomes the responsibility of the USPS or International Post. All orders all packed with special care with lots of attention given to make sure your item arrives in perfect condition. However, things do happen - so insurance is strongly suggested. We cannot be responsible for any damages or lost items caused by USPS. If you would like to add insurance and or delivery confirmation, please let us know and we will adjust the rates accordingly. We gladly ship across seas! Please do note however, we are only able to provide email confirmation that your item has shipped. If you would like your item sent with a delivery confirmation (tracking) number, please contact us prior to ordering and we will adjust the shipping charges to reflect the $40 fee for International Priority. We can not be responsible for lost packages or delays caused during Custom Inspection or Postal carrier error. Please be aware, all custom fees and any duties are the sole responsibility of the buyer. The buyer is responsible for all unexpected customs charges. Customs charges are not included in your shipping cost.